﻿ Power Output Simulation - Next-gen Compact Wind PowerGenerator TWE [TOMO Wind Energy] || BIRUMEN KAGOSHIMA CO.,LTD. 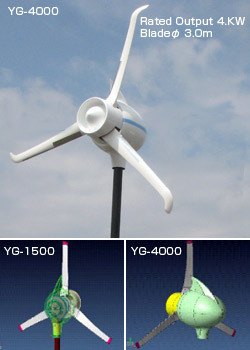 Next-gen Compact Wind PowerGenerator "TWE [TOMO Wind Energy]" (Manufactured by BIRUMEN KAGOSHIMA CO.,LTD.) has unique technology solves the biggest problem with the traditional wind turbines stable power supply is difficult due to changes in wind speed. We have allowed for a stable power supply is less affected by the air volume for this product. This performance has been highly efficient power generation! Now, We have released some field data of "TWE YG-4000"! Previously, we had to collect the measured data of "TWE YG-4000".But It was a very high level of output figures for the field data obtained, we were ahead of the public. We've got enough data and proof from other institutions, so we will publish some of the data. We have to present a unified graph data at the bottom of this page. Future in this page, we will continue to provide the information of the actual annual energy production simulation, simulation costs, set up the flow, etc. And you can see the video in the test driving conditions of "TWE YG-4000". Please click here. There are simulation data predicted. But we are not disclosed here. However,We expose a portion of our data for our customers are considering installation of this product. Please contact us, who wish to view it.